Come taste a delectable creation at Snowdon Delicatessen Ltd. They gladly provide a take-out menu and are open nightly all week. Payments by Interac, MasterCard and Visa are recognized. Ian adds that the Jewish-style deli does benefit from tourists seeking out Montreal smoked meat, but its clientele still skews toward regular patrons who have been coming here for years. And the customers aren’t the only ones sticking around – most of the 40-plus staff members and the entire four-person management team have been around years, even decades. Must order 1 week in advance! Vegetable Barley, Bean and Barley, Pea Soup with Noodles, Cabbage. Have it with Maztoh balls or Kreplach or noodles! Dumplings stuffed with brisket. Delicious in your chicken soup! Roasted buckwheat with fried onions and tiny farfalle pasta. A delicious and nutritious side dish with any plate. broccoli, carrots, celery, cherry tomatoes, red peepers, cauliflower, mushrooms. Served with our home made onion dip. Strawberries, red grapes, kiwi, pineapple, cantaloupe, canary melon, oranges and grapefruits. Swiss, Norvegia, Havarti, Mozzarella, Cheddar. Served wit red grapes and crackers. Single Tuna, Single Egg, Tuna-Egg comb., Salmon-Egg comb. and Cream cheese with Lox and Gerkin Pinwheels. We will beautifully arrange your choice of party sandwiches on a platter or many platters!! Hot Dogs in Blankets (24)..
Only during holiday season or to special order. Your favorite egg rolls with burnt ends. Vegetable or Meat. You choose! Home made dumplings with brisket meat. Amazing in your hot chicken soup. Yum. Tomato sauce base with lots on onions! Sweet and delicious! Our famous Nova lox sliced and trimmed to perfection. Marinated, Shmaltz, Matjes, Sour Cream. Prune, cinnamon, chocolate, apple, cherry, blueberry, cheese. We'll gladly arrange them on a tray if you like. Prune hamantashen all year round. Poppy seed on holidays and by special order. Bran and Blueberry every day. Jam+Raisin or Mixed fruit with Turkish Delight. Lemon-Vanilla with a cherry glaze. Regular coffee included untill 11:00 a.m. everyday/All eggs, omelettes and combinations come with our home potatoes, fruit garnish and choice of toast. Change your potatoes for fruit salad, hot latke or knish (both with apple sauce) for 2,00. Egg whites +1,00/egg. With choice of grilled or cold tomatoes. With choice of smoked meat, corned beef, turkey, salami or beef bacon. With choice of pancakes, french toast or crepes. With or without meat. With lox, cream cheese,tomato, lettuce, capers, onions & olives, bagel or toast. apple sauce and fruit salad. Available toppings: Strawberries, Blueberries, Banana, Melon, Chocolate Chips or Yogurt + Almonds. Kraft on white, whole wheat, rye, challah, kimmel or black bread. stuff chicken, tongue, smoke meat, corn beef. Plain chicken broth with soda crackers. Pickle (sour or half-sour), hot banana, sour tomato, hot cherry or sweet pimento. 3 Cheese Blintzes (served with both sour cream and blueberry sauce) . Assorted deli meats grilled on a toasted hamburger bun. Served with a pickle. Served with coleslaw and choice kasha+bows, home potatoes, fries, chef or caesar salad. All Clubs are served on either white, whole wheat or both. Served with fries, coleslaw and pickle. All platters are served with fries, pickle and rye. Smoked Meat or Corned beef (hot or cold) . Smoked turkey or brisket or roast beef. Served with fries and rye bread. Served with fries, lettuce, tomato and choice of bread. Served with fries, lettuce, tomato and hamburger bun. All salad plates are served with your choice of toppings and choice of two of the following sides: coleslaw, potato salad, cucumber salad, bean salad or pasta salad. 99% fat free Turkey (white meat). A mix of white seed and black seed bagels with lox and cream cheese cut in 1/4's dressed with jumbo black olives and arranged on trays. smoked meat, turkey, stuffed chicken, salami, karnatzel arranged beautifully on trays. Accompanied by potato salad, coleslaw, pickles, rye bread and mustard. Smoked whitefish, smoked carp, smoked salmon and gefilte fish all beautifully arranged on trays. Dressed with capers and garnish. Accompanied by potato salad, coleslaw, horseradish kimmel and black bread. Norvegia, Mozzarella, Cheddar, Swiss and Havarti beautifully arranged on trays dressed with seedless red grapes. Accompanied by crackers. Broccoli, cauliflower, carrots, celery, peppers, mushrooms, shallots and cherry tomatoes all beautifully arranged on trays. Accompanied by freshly made onion dip. Red grapes, strawberries, kiwi, canary melon, cantalope, pineapple, oranges and grapefruit all beautifully arranged on trays. Homemade miniature danish to be arranged beautifully on trays Cherry, blueberry, apple, cinnamon, chocolate, cheese and prune. Our party sandwiches are known world wide and are not only delicious but the originals being that we have been making them for 70 years now. 84 bite size sandwiches on both white and whole wheat bread arranged beautifully on trays. We also offer On Location Smoked Meat Cutting! We will come to your event and cut Smoked Meat and make your guests sandwiches. Entertaining and delicious! Call us to make arrangements. We will gladly supply your coffee and all accompaniements for your large events/gatherings. We supply large thermoses in which our coffee can stay steaming hot for up to 5 hours. We can as well supply all your plates, utensils, cups and napkins. I order from Snowdon Deli all the time and we prefer the smoked meat to Shwartzs. I have never had any food that was disappointing..even the soups are delish. My fave deli in the city!! Un des meilleurs deli de Montréal avec de la smoked meat excellente et des dizaines d'autres plats exquis. Vous pouvez manger sur place ou emporter, les prix sont raisonnables, et surtout, pas besoin de faire la queue des heures comme chez Schwart'z : c'est au moins aussi bon et l’accueil est bien meilleurs. 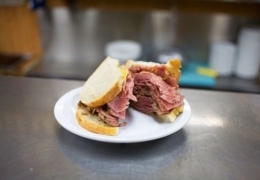 Located on Decarie, near the Snowdon metro, the Snowdon Deli serves juicy, tender smoked meat to its visitors, along with other authentic Jewish dishes. You can order a smoked meat sandwich, made to perfection on rye bread with yellow mustard, and you have the option to add chopped liver. They also have a take-out counter for those who are in a rush, but still need their smoked-meat fix.